Wet Seal is having a contest for Valentine's Day. For this contest, you can create your own Valentine's Day outfits and receive a $100 Wet Seal gift card if your outfit wins. To enter; sign up for or login to the fashion community, go to "My Boutique", design an outfit, tag your outfit as "V-Day 2009", and submit it to the runway! Make sure your outfit includes at least 3 or more items in order for it to be considered. Read the contest rules for more details. I will post the outfits I created for the contest below. This article is also somewhat of a follow-up to my last blog entry since my contest outfits would also be great to wear for a Valentine date. The outfit with the most votes in the fashion community will win. The person with the winning outfit will receive a $100 gift card. The runner up will get a $75 gift card, and 3rd place will win a $50 gift card. The contest ends on February 13, 2009 at 11:59 PM, so start styling as soon as possible if you would like to participate! Let me know if you want me to vote for your outfits to help your chances of winning the contest. E-mail me at Charmed42787@gmail.com or send me a message via myspace. You can also send me a message through the Wet Seal fashion community. My Wet Seal screen name is Charmed42787. 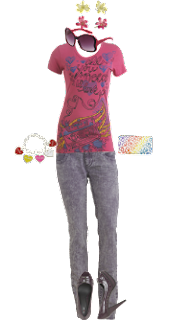 Please note that the oufits I posted from Wet Seal in my previous entry are not meant for the contest as I had styled them before the start date of January 23, 2009. Have fun styling, and good luck to everyone who enters the contest! And most importantly, Happy Valentine's Day! Thanks for your comment and yea, the title was nice ! I wasn't really very fed up. it's just that i'm so short tempered that at times i can't handle situations properly! Glad you liked my poem! Check out my new one! Cursed: I understand what that can be like. You're new poem is amazing, by the way!